Mel the Dog Pez dispenser. It seems like all I write about these days is stuff on Noggin, particularly Jack's Big Music Show. To be honest, I'm not finding a lot to blog about these days. And the older Madame gets, the busier I am and (although I hate to say it) the less interested in blogging I am. But all that aside, this is definitely blog worthy. 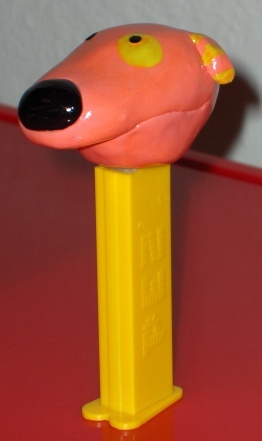 MDD reader Jon made a custom Mel the Dog Pez dispenser. It's up on eBay right now (bidding ends February 19th).